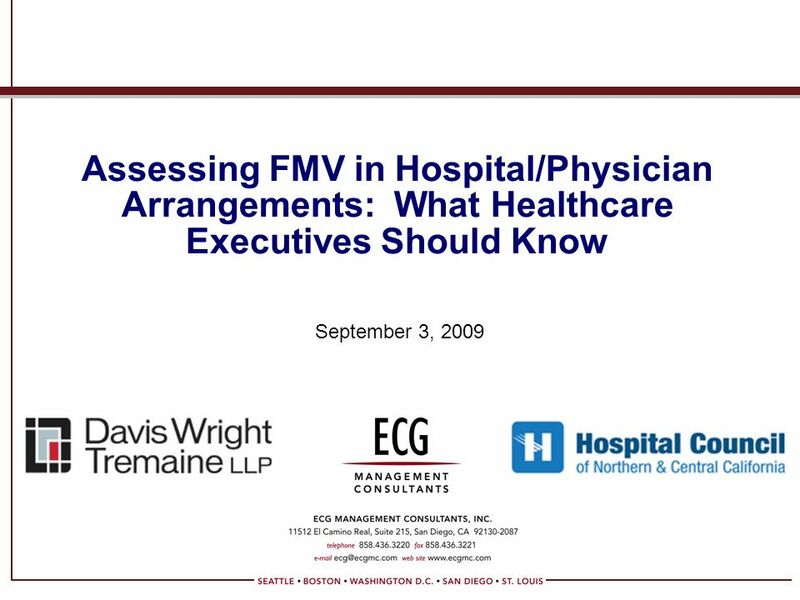 The purpose of this presentation is to provide hospital executives with workable guidelines for establishing when and how to assess FMV in a variety of hospital/physician arrangements. 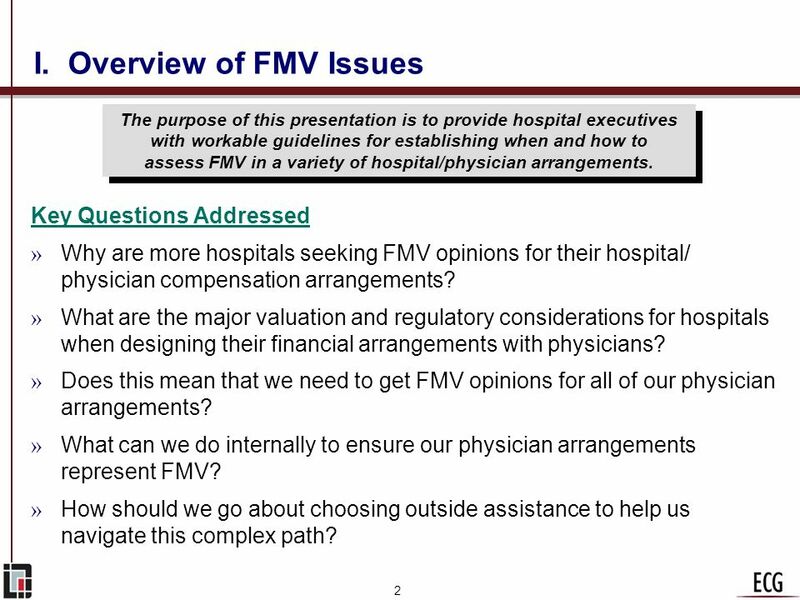 Key Questions Addressed Why are more hospitals seeking FMV opinions for their hospital/ physician compensation arrangements? What are the major valuation and regulatory considerations for hospitals when designing their financial arrangements with physicians? 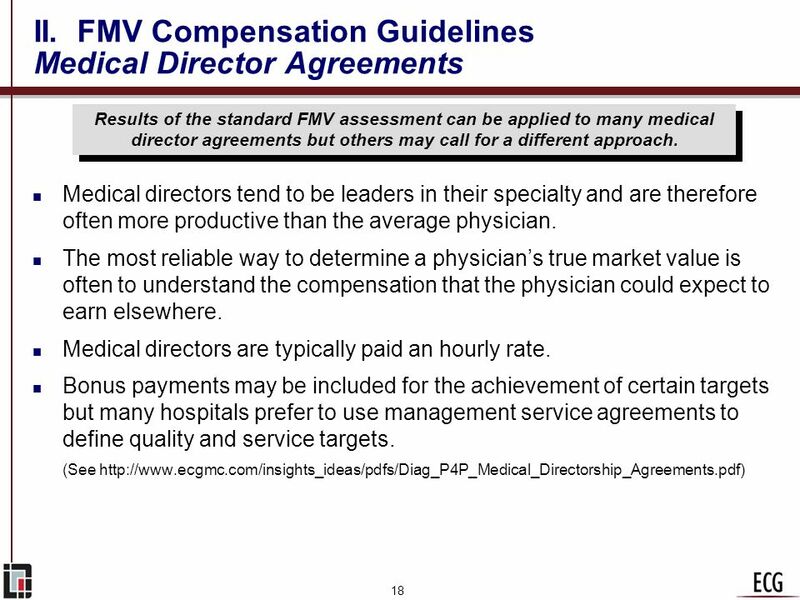 Does this mean that we need to get FMV opinions for all of our physician arrangements? 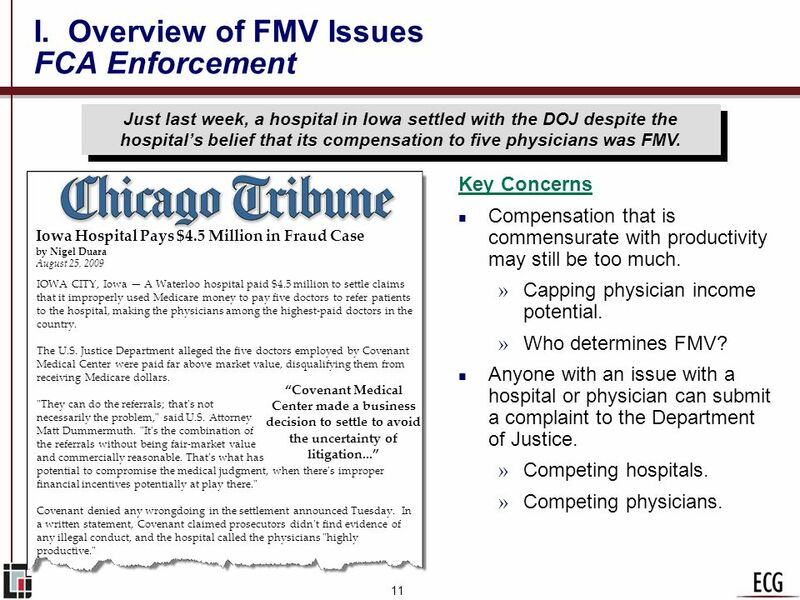 What can we do internally to ensure our physician arrangements represent FMV? How should we go about choosing outside assistance to help us navigate this complex path? Hospitals enter a variety of arrangements with physicians to meet strategic objectives, improve physician integration, and mitigate financial risk. 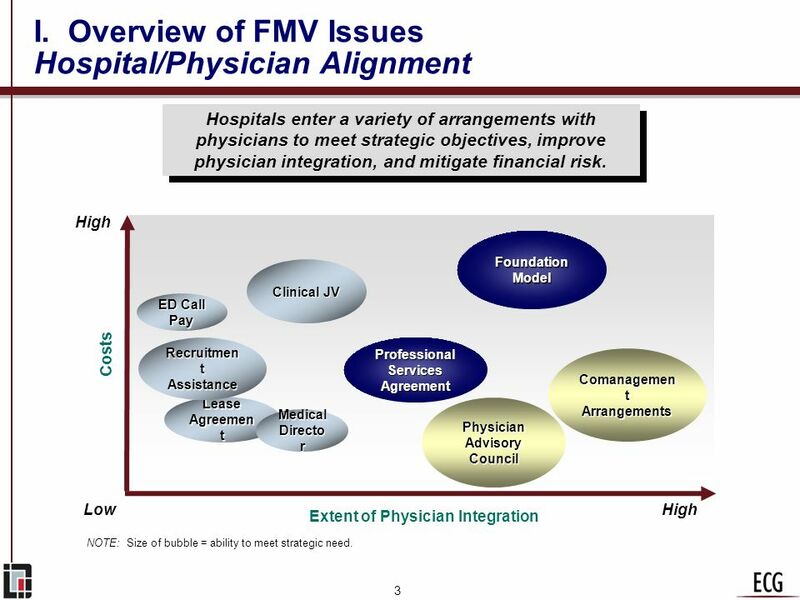 High Foundation Model Clinical JV ED Call Pay Costs Recruitment Assistance Professional Services Agreement Comanagement Arrangements Lease Agreement Physician Advisory Council Medical Director Low High Extent of Physician Integration NOTE: Size of bubble = ability to meet strategic need. 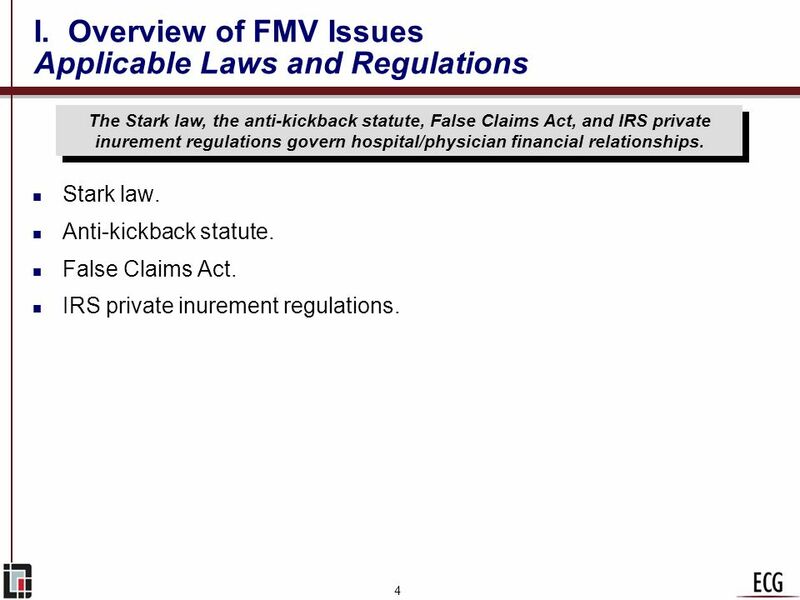 The Stark law, the anti-kickback statute, False Claims Act, and IRS private inurement regulations govern hospital/physician financial relationships. Stark law. Anti-kickback statute. 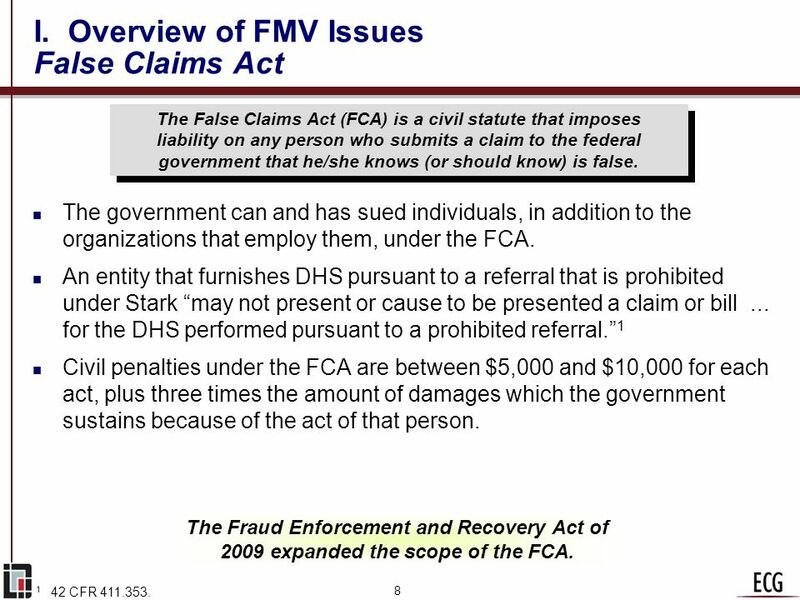 False Claims Act. IRS private inurement regulations. 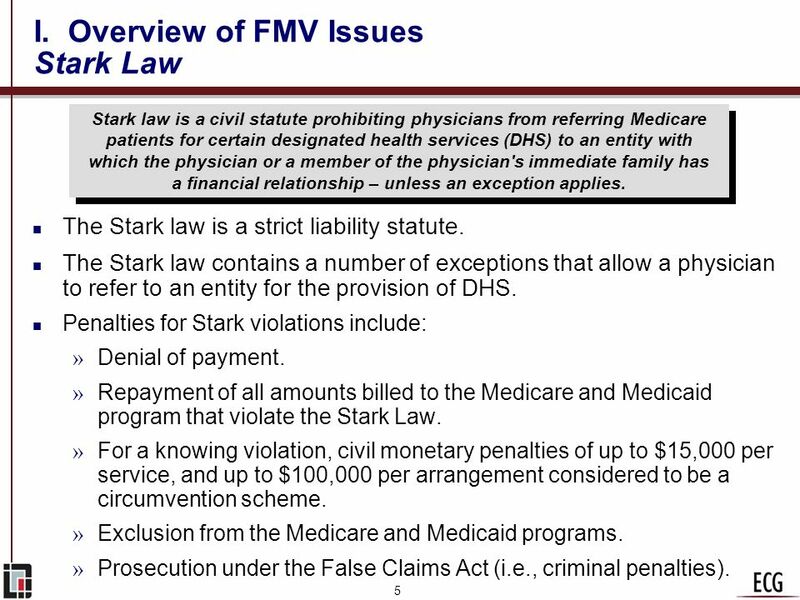 Stark law is a civil statute prohibiting physicians from referring Medicare patients for certain designated health services (DHS) to an entity with which the physician or a member of the physician's immediate family has a financial relationship – unless an exception applies. The Stark law is a strict liability statute. The Stark law contains a number of exceptions that allow a physician to refer to an entity for the provision of DHS. Penalties for Stark violations include: Denial of payment. Repayment of all amounts billed to the Medicare and Medicaid program that violate the Stark Law. For a knowing violation, civil monetary penalties of up to $15,000 per service, and up to $100,000 per arrangement considered to be a circumvention scheme. Exclusion from the Medicare and Medicaid programs. Prosecution under the False Claims Act (i.e., criminal penalties). The anti-kickback statute is a criminal statute prohibiting any knowing or willful solicitation or acceptance of any type of remuneration to induce referrals for health services that are reimbursable by the Federal government. 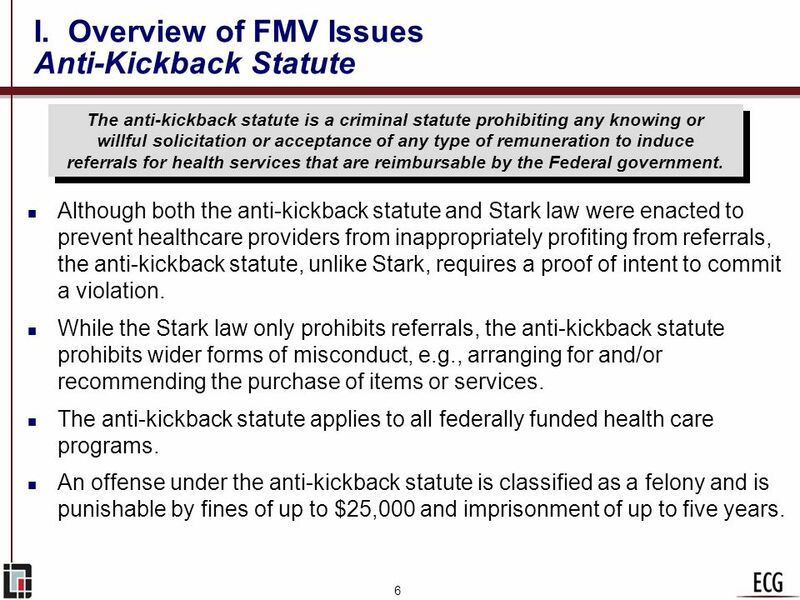 Although both the anti-kickback statute and Stark law were enacted to prevent healthcare providers from inappropriately profiting from referrals, the anti-kickback statute, unlike Stark, requires a proof of intent to commit a violation. While the Stark law only prohibits referrals, the anti-kickback statute prohibits wider forms of misconduct, e.g., arranging for and/or recommending the purchase of items or services. The anti-kickback statute applies to all federally funded health care programs. An offense under the anti-kickback statute is classified as a felony and is punishable by fines of up to $25,000 and imprisonment of up to five years. 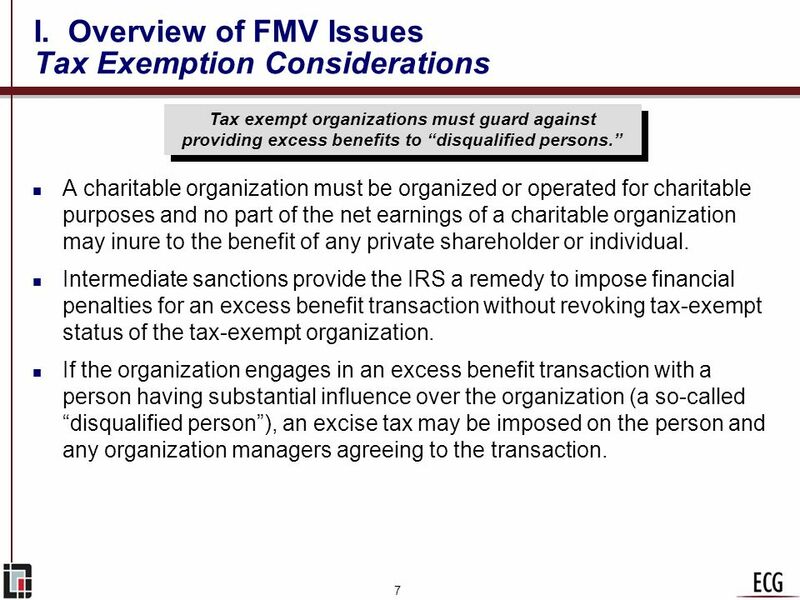 Tax exempt organizations must guard against providing excess benefits to “disqualified persons.” A charitable organization must be organized or operated for charitable purposes and no part of the net earnings of a charitable organization may inure to the benefit of any private shareholder or individual. Intermediate sanctions provide the IRS a remedy to impose financial penalties for an excess benefit transaction without revoking tax-exempt status of the tax-exempt organization. If the organization engages in an excess benefit transaction with a person having substantial influence over the organization (a so-called “disqualified person”), an excise tax may be imposed on the person and any organization managers agreeing to the transaction. At the same time that hospitals have been begun to develop more hardwired relationships with their physicians, regulatory scrutiny of these relationships has increased. 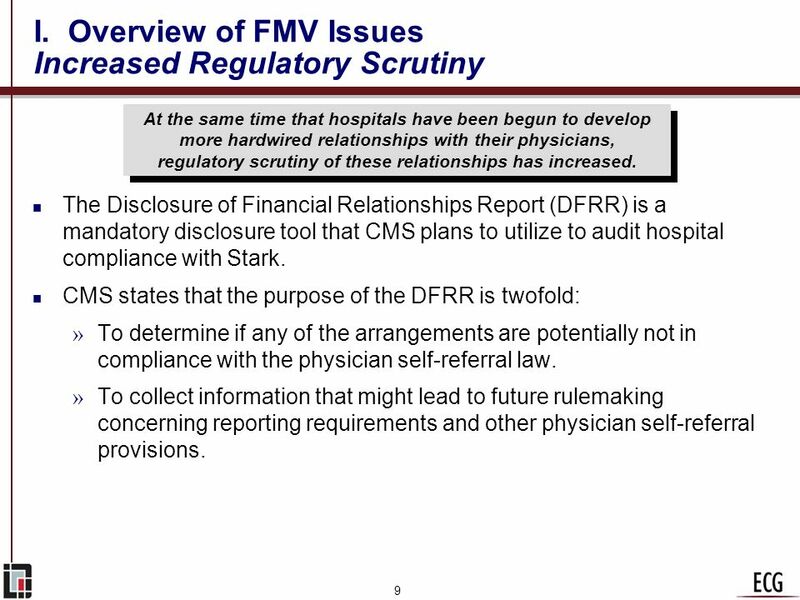 The Disclosure of Financial Relationships Report (DFRR) is a mandatory disclosure tool that CMS plans to utilize to audit hospital compliance with Stark. CMS states that the purpose of the DFRR is twofold: To determine if any of the arrangements are potentially not in compliance with the physician self-referral law. To collect information that might lead to future rulemaking concerning reporting requirements and other physician self-referral provisions. 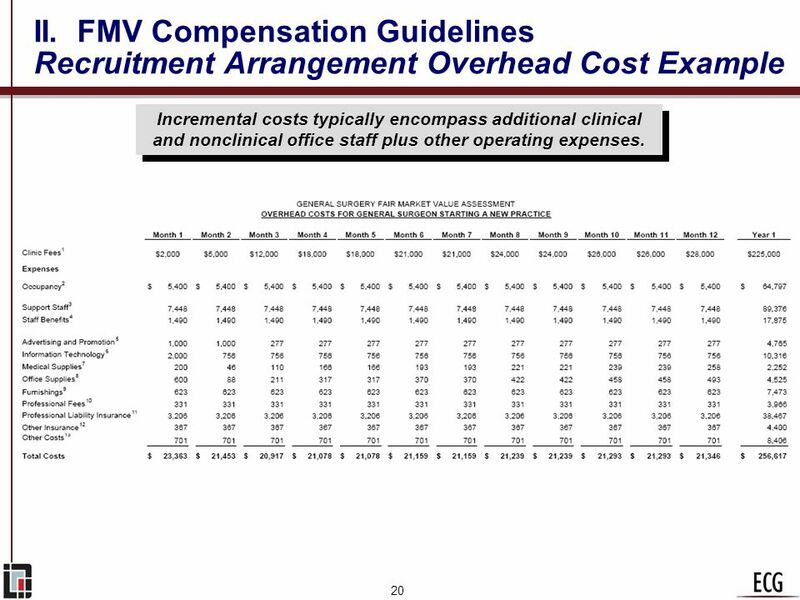 The analysis and the data sources utilized to calculate FMV compensation vary based on the circumstances of the specific arrangement. “Ultimately, fair market value is determined based on facts and circumstances. The appropriate method will depend on the nature of the transaction, its location, and other factors.”1 Factors influencing the appropriate approach to determining FMV include: Services provided. Physician specialty. Availability of physicians. Physician productivity. Market and competitive factors. 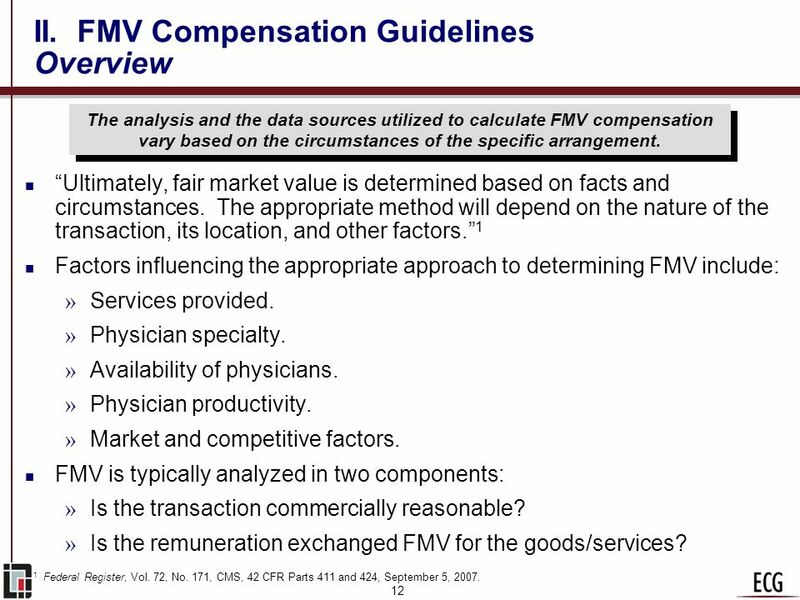 FMV is typically analyzed in two components: Is the transaction commercially reasonable? Is the remuneration exchanged FMV for the goods/services? 1	Federal Register, Vol. 72, No. 171, CMS, 42 CFR Parts 411 and 424, September 5, 2007. The appropriate methodology to use to calculate FMV compensation is affected by the business situation and financial arrangement. 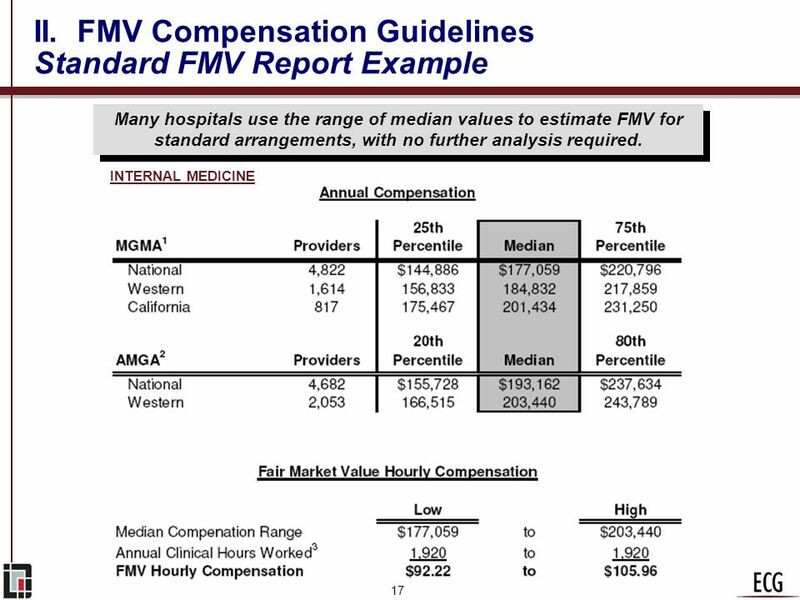 Industry Percentile Rankings FMV is estimated based on industry percentile rankings for compensation and productivity and assumes that physicians who produce at low levels relative to their specialty will also receive relatively low incomes and that high producers will earn high incomes. 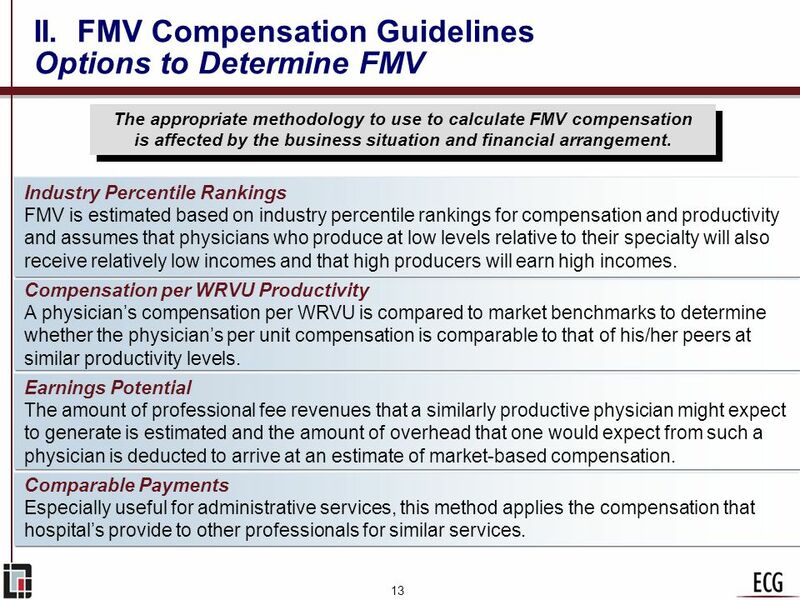 Compensation per WRVU Productivity A physician’s compensation per WRVU is compared to market benchmarks to determine whether the physician’s per unit compensation is comparable to that of his/her peers at similar productivity levels. Earnings Potential The amount of professional fee revenues that a similarly productive physician might expect to generate is estimated and the amount of overhead that one would expect from such a physician is deducted to arrive at an estimate of market-based compensation. Comparable Payments Especially useful for administrative services, this method applies the compensation that hospital’s provide to other professionals for similar services. A key distinguishing business characteristic of arrangements is whether they are for clinical or administrative services. CMS raised the question whether or not there should be a difference between administrative and clinical compensation in Phase III regulations but left the question unanswered. 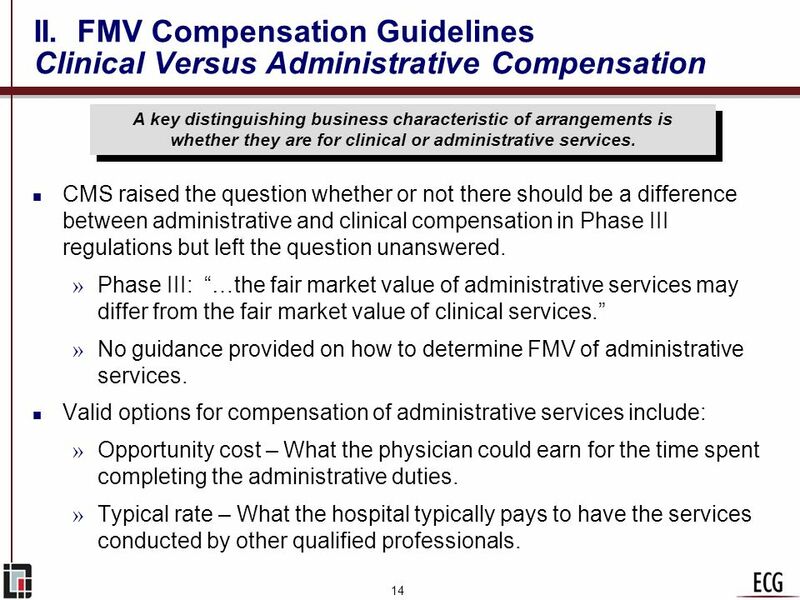 Phase III: “…the fair market value of administrative services may differ from the fair market value of clinical services.” No guidance provided on how to determine FMV of administrative services. Valid options for compensation of administrative services include: Opportunity cost – What the physician could earn for the time spent completing the administrative duties. Typical rate – What the hospital typically pays to have the services conducted by other qualified professionals. Hospitals enter many different types of arrangements with physicians to address various strategic priorities. 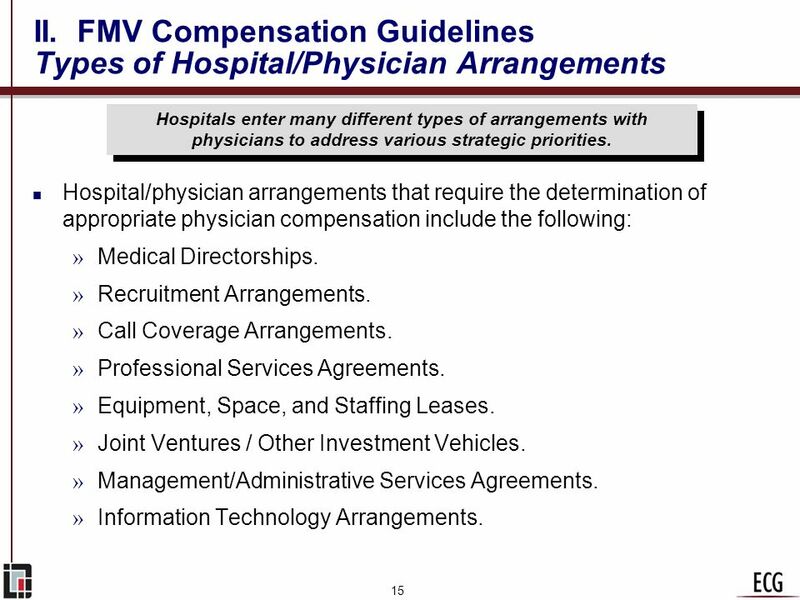 Hospital/physician arrangements that require the determination of appropriate physician compensation include the following: Medical Directorships. Recruitment Arrangements. Call Coverage Arrangements. Professional Services Agreements. Equipment, Space, and Staffing Leases. Joint Ventures / Other Investment Vehicles. Management/Administrative Services Agreements. Information Technology Arrangements. Hospitals should consider an efficient and economical option that provides an FMV assessment that can be applied to many arrangements. A report providing an FMV range for approximately 100 specialties and subspecialties can be utilized for many arrangements. Annual compensation and hourly rates are calculated for each specialty based on national, regional, and state data from two surveys. Medical Group Management Association (MGMA) Physician Compensation and Production Survey. American Medical Group Association (AMGA) Medical Group Compensation & Financial Survey. 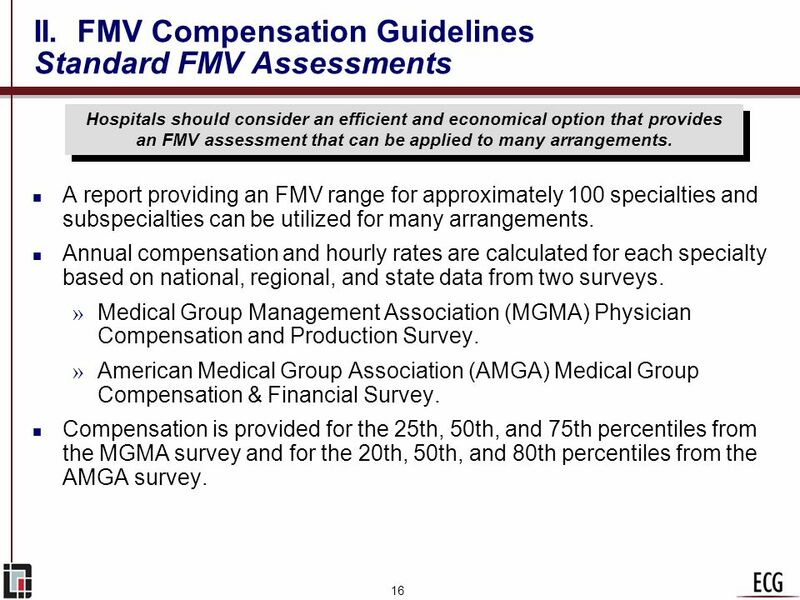 Compensation is provided for the 25th, 50th, and 75th percentiles from the MGMA survey and for the 20th, 50th, and 80th percentiles from the AMGA survey. Recruitment arrangements typically include an income guarantee and reimbursement of business expenses. 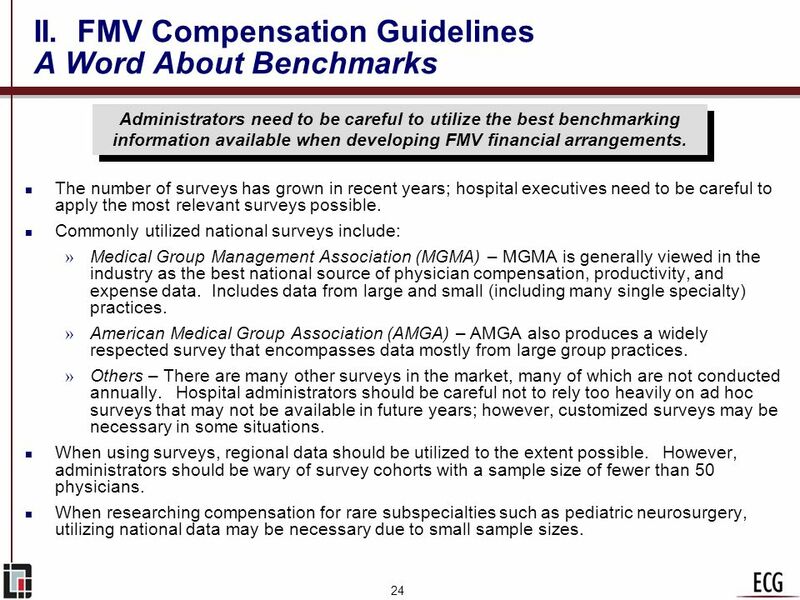 A range of compensation based on the median compensation provided in the MGMA and AMGA surveys is useful. Incremental and one-time costs are estimated to assess a reasonable monthly allowance for overhead costs for the recruited physician’s practice. Incremental costs typically encompass additional clinical and nonclinical office staff plus other operating expenses, including malpractice insurance. One-time costs typically encompass relocation and start-up expenses. Costs to start a new practice and to join an existing practice are estimated. 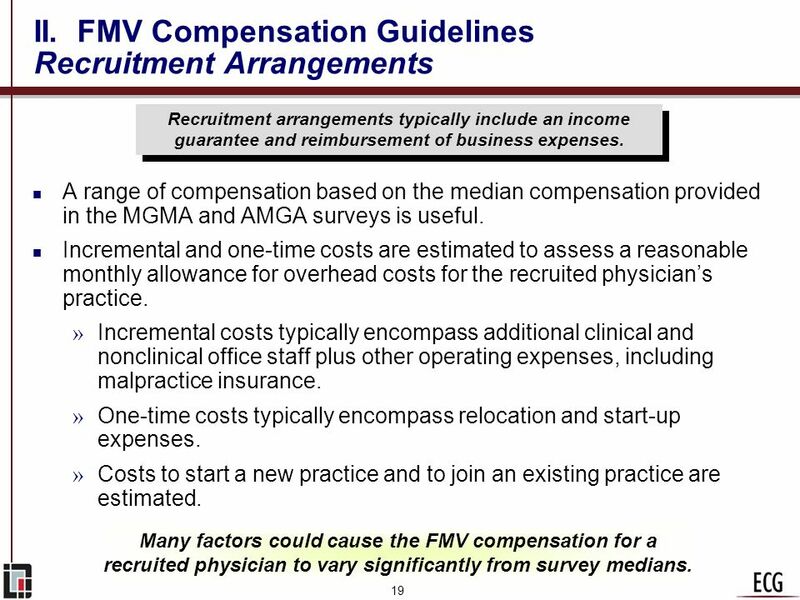 Many factors could cause the FMV compensation for a recruited physician to vary significantly from survey medians. Incremental costs typically encompass additional clinical and nonclinical office staff plus other operating expenses. 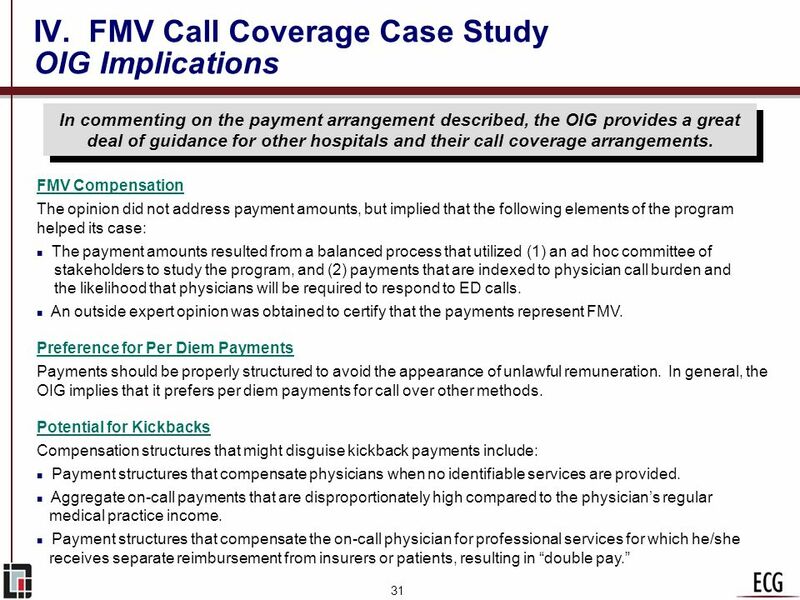 Stipends for call coverage duties have exploded as physicians increasingly utilize their market leverage to demand payment for the burden of call coverage. 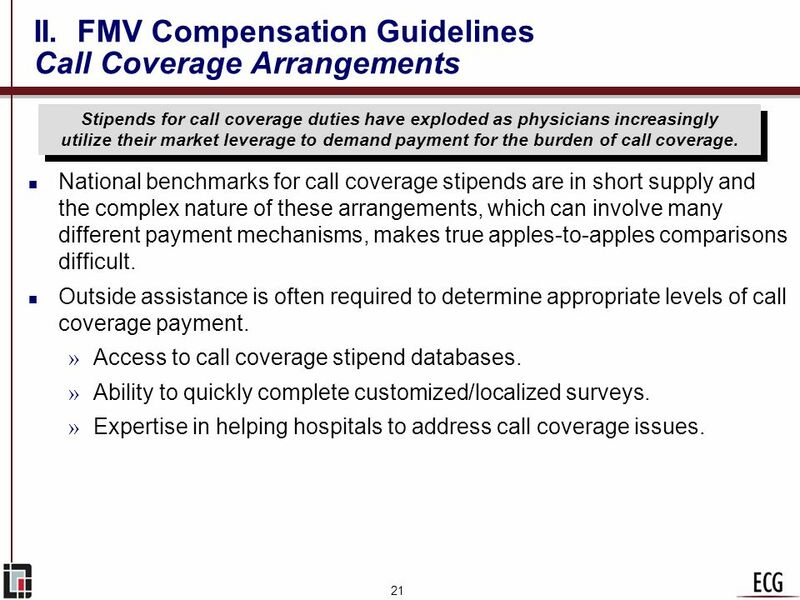 National benchmarks for call coverage stipends are in short supply and the complex nature of these arrangements, which can involve many different payment mechanisms, makes true apples-to-apples comparisons difficult. 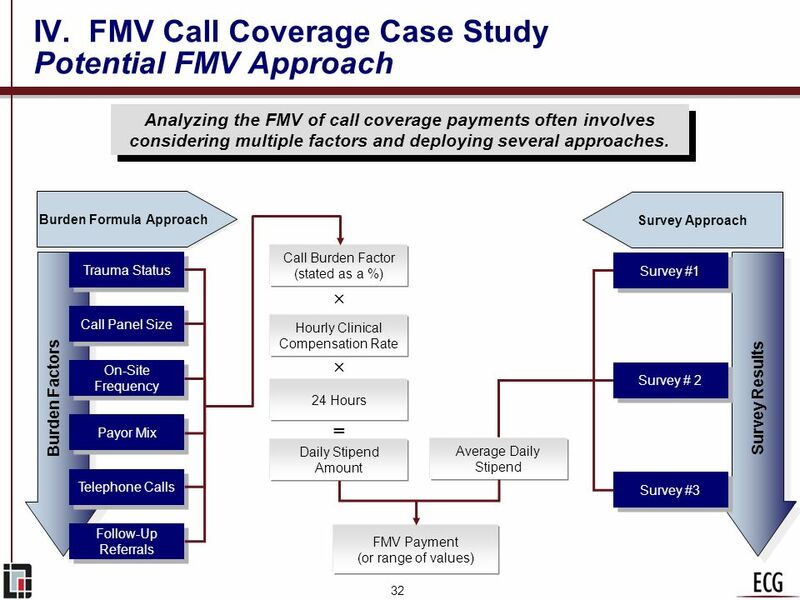 Outside assistance is often required to determine appropriate levels of call coverage payment. Access to call coverage stipend databases. 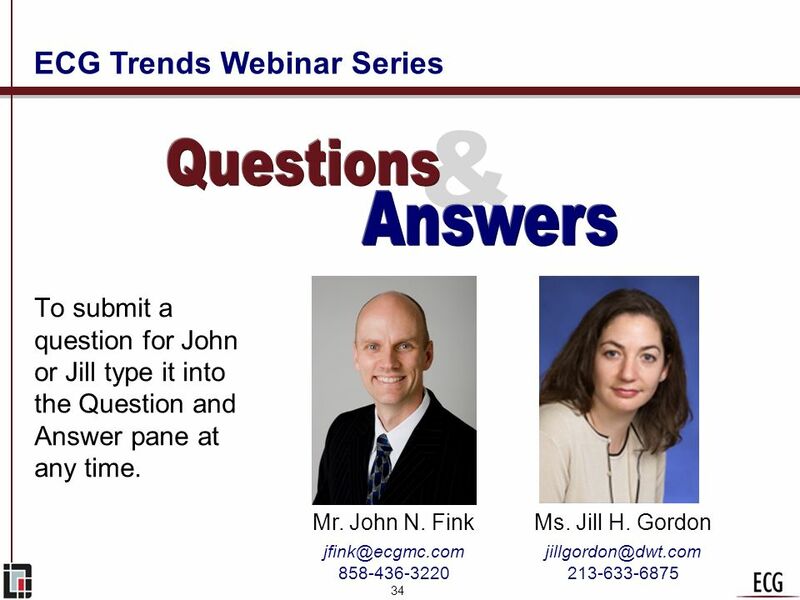 Ability to quickly complete customized/localized surveys. 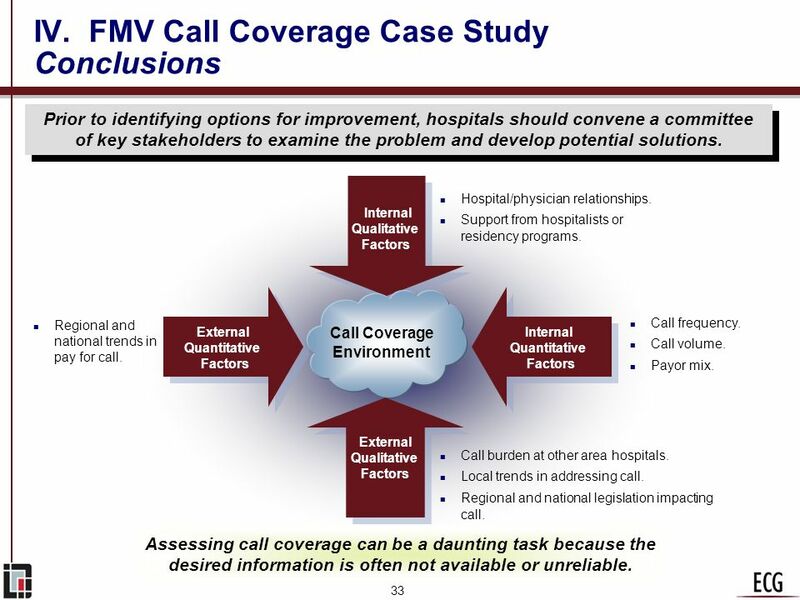 Expertise in helping hospitals to address call coverage issues. 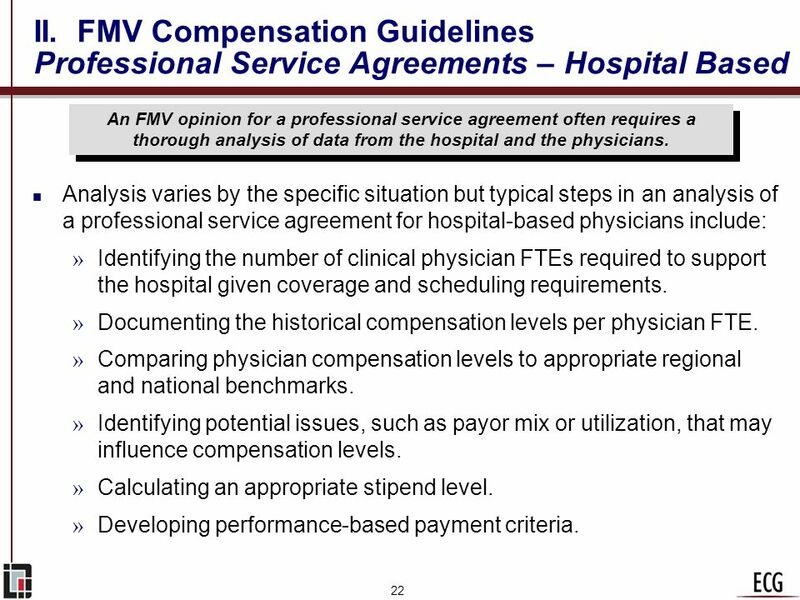 An FMV opinion for a professional service agreement often requires a thorough analysis of data from the hospital and the physicians. Analysis varies by the specific situation but typical steps in an analysis of a professional service agreement for hospital-based physicians include: Identifying the number of clinical physician FTEs required to support the hospital given coverage and scheduling requirements. Documenting the historical compensation levels per physician FTE. Comparing physician compensation levels to appropriate regional and national benchmarks. Identifying potential issues, such as payor mix or utilization, that may influence compensation levels. Calculating an appropriate stipend level. Developing performance-based payment criteria. Compensation arrangements often require creative solutions to achieve business objectives and provide a fair compensation package to the physician. Situation Resolution Medical director who is licensed as a family practitioner is specially trained and conducts many procedures typically performed by a specialist. Evaluate the mix of medical services the physician provides to the mix provided by other family practice physicians in his state from ECG proprietary surveys to determine whether family practice or specialty compensation is appropriate. Hospital intends to pay physicians $150 per hour to assist with the design of its electronic medical record. Convert the median annual compensation rate for all available specialties listed in the MGMA and AMGA reports into a range of hourly rates to confirm $150 is within the range. Hospital intends to pay physicians $139 per hour for participation on committees that provide administrative services. Apply the range of compensation that the hospital provides to non-physician professionals (i.e., business consultants and attorneys) to the compensation for physicians. Hospital wishes to recruit a renowned clinician and researcher earning in excess of $1 million annually. Identify a pool of academicians and clinical leaders with comparable income and determine whether the candidate is qualified to be considered for membership in this select group. 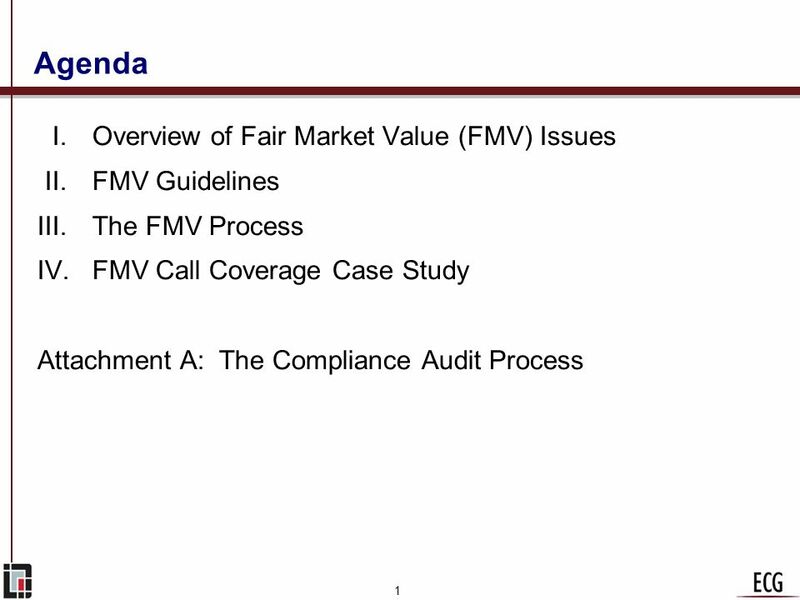 Administrators need to be careful to utilize the best benchmarking information available when developing FMV financial arrangements. The number of surveys has grown in recent years; hospital executives need to be careful to apply the most relevant surveys possible. Commonly utilized national surveys include: Medical Group Management Association (MGMA) – MGMA is generally viewed in the industry as the best national source of physician compensation, productivity, and expense data. Includes data from large and small (including many single specialty) practices. American Medical Group Association (AMGA) – AMGA also produces a widely respected survey that encompasses data mostly from large group practices. Others – There are many other surveys in the market, many of which are not conducted annually. Hospital administrators should be careful not to rely too heavily on ad hoc surveys that may not be available in future years; however, customized surveys may be necessary in some situations. When using surveys, regional data should be utilized to the extent possible. However, administrators should be wary of survey cohorts with a sample size of fewer than 50 physicians. When researching compensation for rare subspecialties such as pediatric neurosurgery, utilizing national data may be necessary due to small sample sizes. 25 III. The FMV Process When Do You Need a Third-Party Opinion? Clearly, all hospital/financial relationships should be well documented in terms of FMV. However, not all relationships require a third-party opinion. 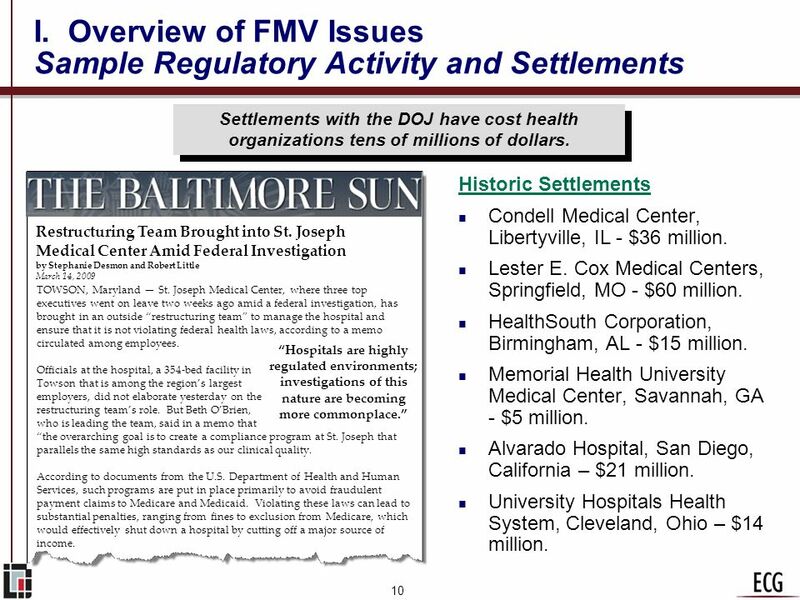 All hospital contracts should be maintained in files that also provide FMV justification. However, FMV justification does not necessarily require outside assistance. Medical directorships and employed physician arrangements represent examples of when hospitals might not seek a third-party opinion, except under unique circumstances. Developing an internal policy on when to seek FMV opinions will help hospitals decide when to most appropriately seek outside assistance. 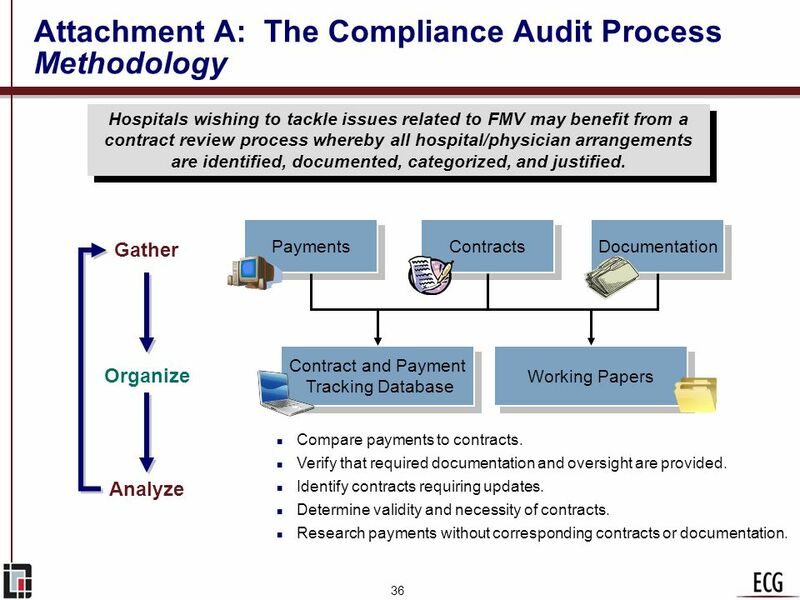 Hospitals should consider developing policies regarding (1) the level of consistency required among their arrangements, and (2) when they will seek FMV opinions. Type of Arrangement Proposed Consistent Payment Methodology Proposed Policy Regarding Third-Party Opinions Medical Directorships Payment will be made using the average of the median of the most relevant market surveys. “Relevant” is defined as using the regional benchmark with a sample size of 50 physicians or more. Analysis can be completed internally to determine relevant market rates; however, a third-party opinion will be sought in the event that the compensation to be provided exceeds the 75th percentile. Call Coverage Call coverage payment rates will be set based on principles developed by administrators and medical staff members. Payment arrangements are reviewed annually. The algorithm will be updated annually, and a third-party opinion of the key components of the plan will be required upon each update. Hospital-Based Specialty Stipends will be provided that enable physicians to earn between the median and the 75th percentile of their specialty. 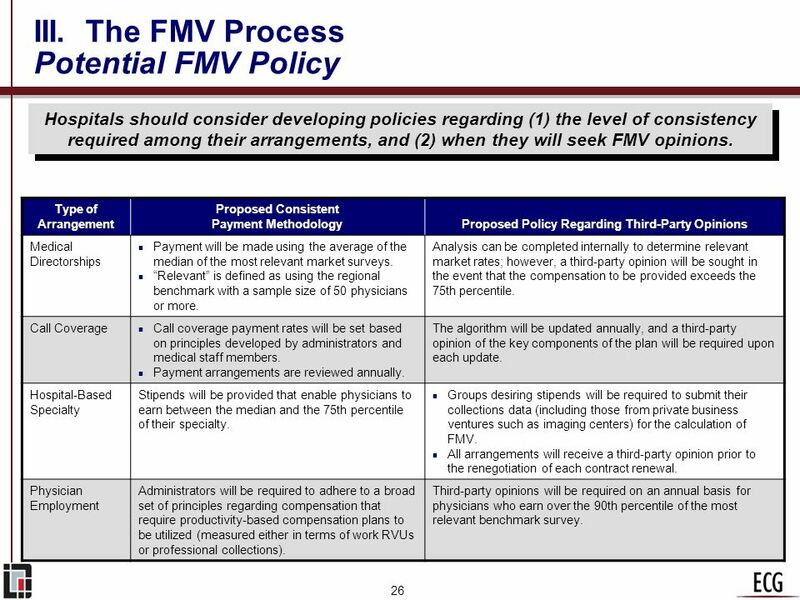 Groups desiring stipends will be required to submit their collections data (including those from private business ventures such as imaging centers) for the calculation of FMV. All arrangements will receive a third-party opinion prior to the renegotiation of each contract renewal. 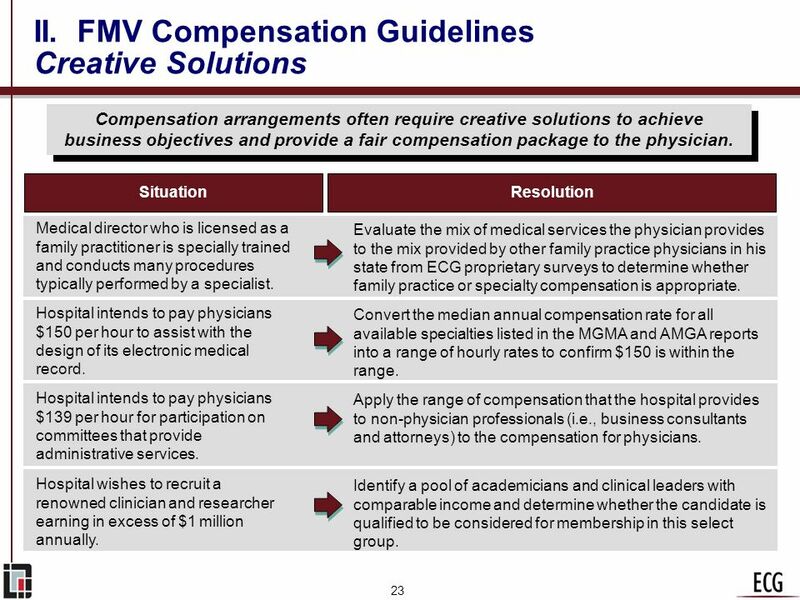 Physician Employment Administrators will be required to adhere to a broad set of principles regarding compensation that require productivity-based compensation plans to be utilized (measured either in terms of work RVUs or professional collections). Third-party opinions will be required on an annual basis for physicians who earn over the 90th percentile of the most relevant benchmark survey. There are several key attributes to look for when choosing and using a firm to obtain a valuation opinion. Choose an experienced resource. Obviously, the firm utilized to develop your opinions should have broad experience covering a variety of healthcare arrangements. Identify a firm with local knowledge. As the market for physician compensation varies widely, market to market, the firm should understand your particular niche. Utilize a well-balanced firm. Although firms that work exclusively in the valuation/FMV opinion world will be knowledgeable about this issue, they may not have the breadth of experience necessary to evaluate all issues in totality. Consider a firm with experience developing compensation plans that also has consultants who are comfortable working directly with physicians. Consider a firm that has the expertise to provide custom analyses and does not rely exclusively on survey data for proprietary databases. Avoid pushovers. Be wary of firms that will provide justification for any arrangement; a good firm will push back and provide creative restructuring options frequently to ensure FMV, thereby ensuring greater credibility if the arrangement is challenged. 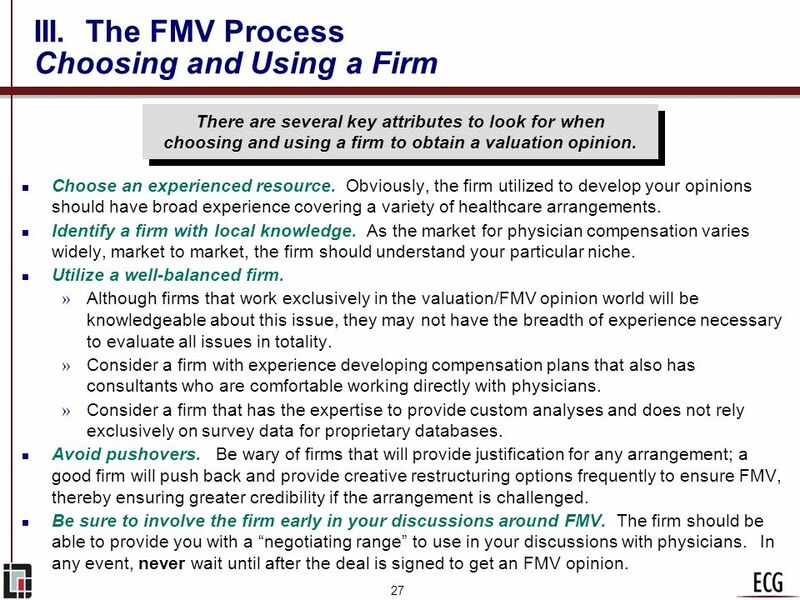 Be sure to involve the firm early in your discussions around FMV. The firm should be able to provide you with a “negotiating range” to use in your discussions with physicians. In any event, never wait until after the deal is signed to get an FMV opinion. 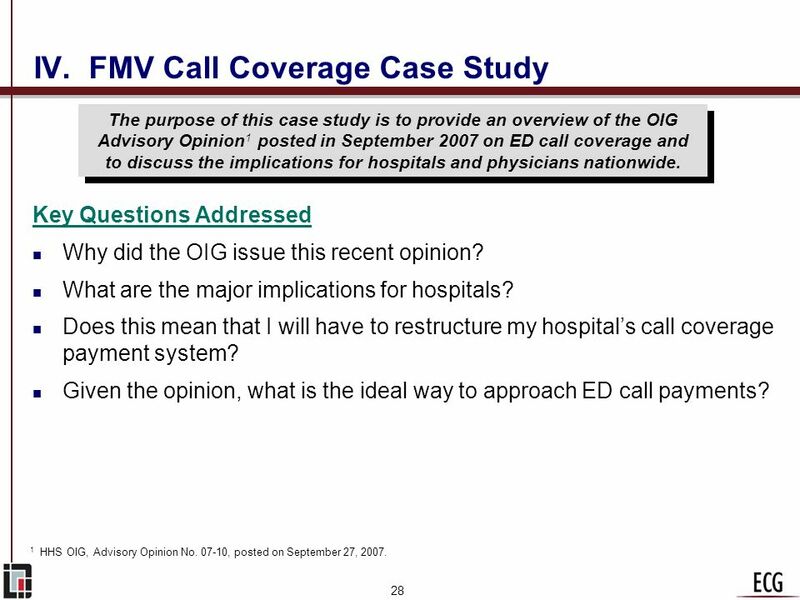 The purpose of this case study is to provide an overview of the OIG Advisory Opinion1 posted in September 2007 on ED call coverage and to discuss the implications for hospitals and physicians nationwide. Key Questions Addressed Why did the OIG issue this recent opinion? What are the major implications for hospitals? Does this mean that I will have to restructure my hospital’s call coverage payment system? Given the opinion, what is the ideal way to approach ED call payments? 1 HHS OIG, Advisory Opinion No , posted on September 27, 2007. 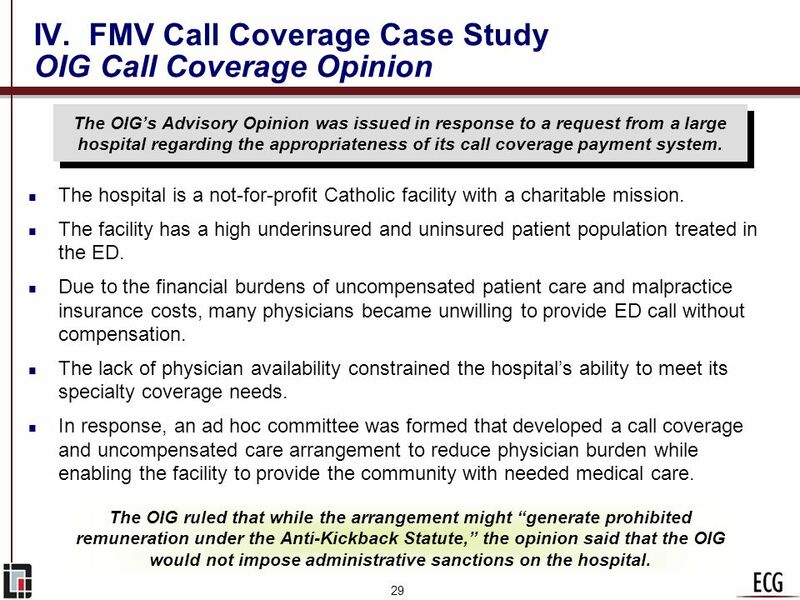 The OIG’s Advisory Opinion was issued in response to a request from a large hospital regarding the appropriateness of its call coverage payment system. The hospital is a not-for-profit Catholic facility with a charitable mission. The facility has a high underinsured and uninsured patient population treated in the ED. Due to the financial burdens of uncompensated patient care and malpractice insurance costs, many physicians became unwilling to provide ED call without compensation. The lack of physician availability constrained the hospital’s ability to meet its specialty coverage needs. In response, an ad hoc committee was formed that developed a call coverage and uncompensated care arrangement to reduce physician burden while enabling the facility to provide the community with needed medical care. The OIG ruled that while the arrangement might “generate prohibited remuneration under the Anti-Kickback Statute,” the opinion said that the OIG would not impose administrative sanctions on the hospital. 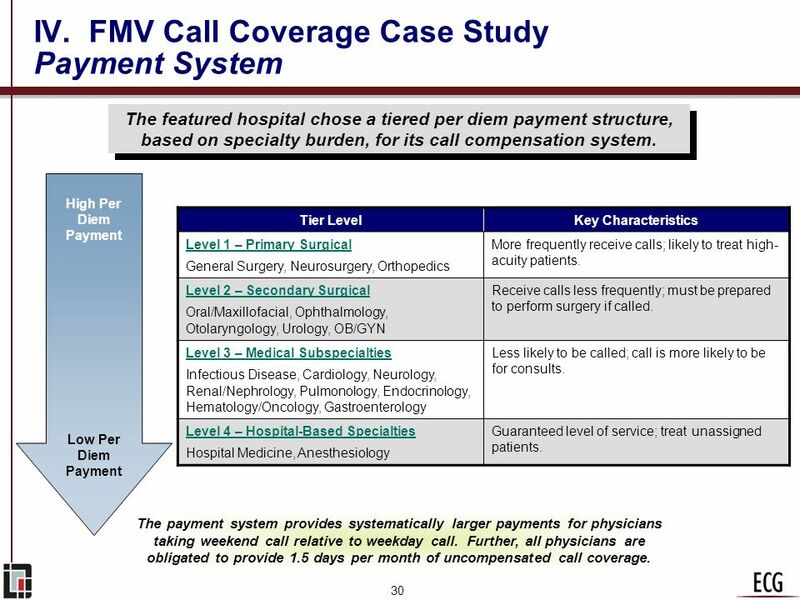 The featured hospital chose a tiered per diem payment structure, based on specialty burden, for its call compensation system. High Per Diem Payment Tier Level Key Characteristics Level 1 – Primary Surgical General Surgery, Neurosurgery, Orthopedics More frequently receive calls; likely to treat high- acuity patients. Level 2 – Secondary Surgical Oral/Maxillofacial, Ophthalmology, Otolaryngology, Urology, OB/GYN Receive calls less frequently; must be prepared to perform surgery if called. Level 3 – Medical Subspecialties Infectious Disease, Cardiology, Neurology, Renal/Nephrology, Pulmonology, Endocrinology, Hematology/Oncology, Gastroenterology Less likely to be called; call is more likely to be for consults. Level 4 – Hospital-Based Specialties Hospital Medicine, Anesthesiology Guaranteed level of service; treat unassigned patients. Low Per Diem Payment The payment system provides systematically larger payments for physicians taking weekend call relative to weekday call. Further, all physicians are obligated to provide 1.5 days per month of uncompensated call coverage. Prior to identifying options for improvement, hospitals should convene a committee of key stakeholders to examine the problem and develop potential solutions. Internal Qualitative Factors Hospital/physician relationships. Support from hospitalists or residency programs. External Quantitative Factors Call Coverage Environment Internal Quantitative Factors Regional and national trends in pay for call. Call frequency. Call volume. Payor mix. External Qualitative Factors Call burden at other area hospitals. Local trends in addressing call. Regional and national legislation impacting call. Assessing call coverage can be a daunting task because the desired information is often not available or unreliable. 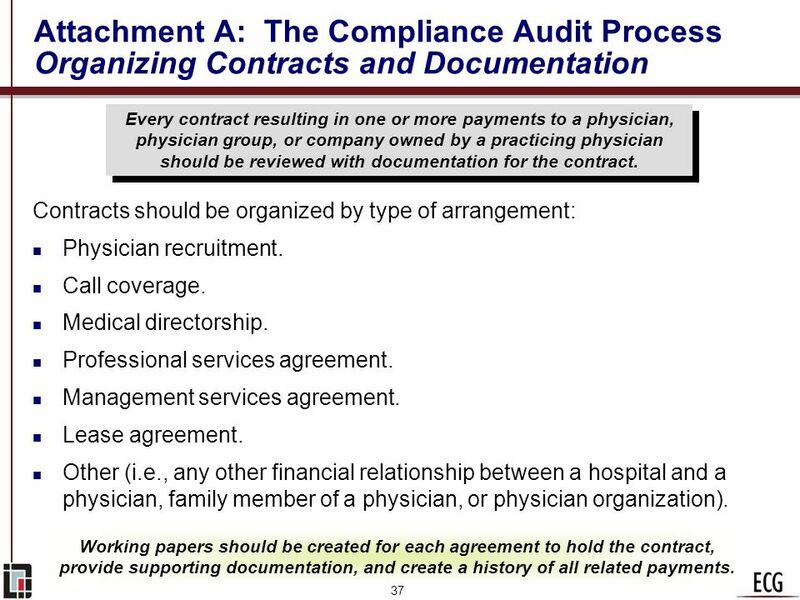 Every contract resulting in one or more payments to a physician, physician group, or company owned by a practicing physician should be reviewed with documentation for the contract. Contracts should be organized by type of arrangement: Physician recruitment. Call coverage. Medical directorship. Professional services agreement. Management services agreement. Lease agreement. Other (i.e., any other financial relationship between a hospital and a physician, family member of a physician, or physician organization). Working papers should be created for each agreement to hold the contract, provide supporting documentation, and create a history of all related payments. 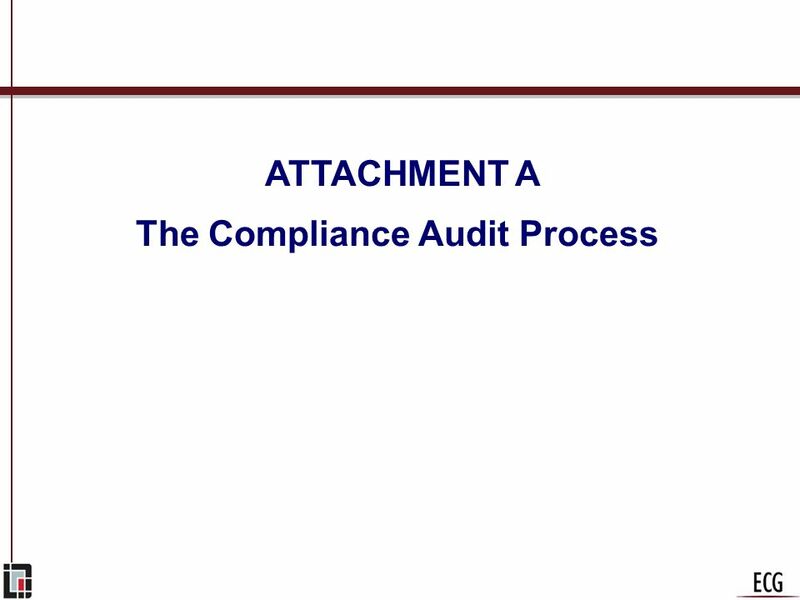 Attachment A: The Compliance Audit Process Developing and Completing Checklists Checklists should be prepared for every type of arrangement and completed consistently for every contract. # Recruitment or Retention Agreement Checklist True False Instructions/Comments 1 The agreement is signed by all parties. List the parties to the agreement. 2 The agreement specifies the benefits to be provided by the hospital, the terms under which benefits are to be provided, and the obligations of the parties. List the services to be performed. 3 The agreement contains a statement that the parties' arrangement was negotiated at arm’s length. List the intervals, length, and charge per interval. 4 The agreement indicates that the hospital's service area is a federally designated health profession shortage area or that a community need assessment indicates a documented need for the physician's specialty. 5 The agreement indicates that the recruited physician has been practicing medicine for less than 1 year and is opening a practice in the hospital's service area. 6 The agreement indicates that the recruited physician is relocating his/her practice by at least 25 miles or that the physician's new practice will derive at least 75% of its revenues from professional services to patients not seen or treated by the physician in the prior 3 years. 7 The agreement indicates that the physician was not on the medical staff of the hospital prior to recruitment, including temporary staff privileges or other seemingly inactive privileges. Indicate the term of the agreement, including the effective date. 8 The agreement indicates that a fair market value (FMV) analysis was performed by an independent third party. 9 The recruitment benefits provided under the agreement do not exceed the range identified in the FMV assessment. Briefly describe the termination provisions. 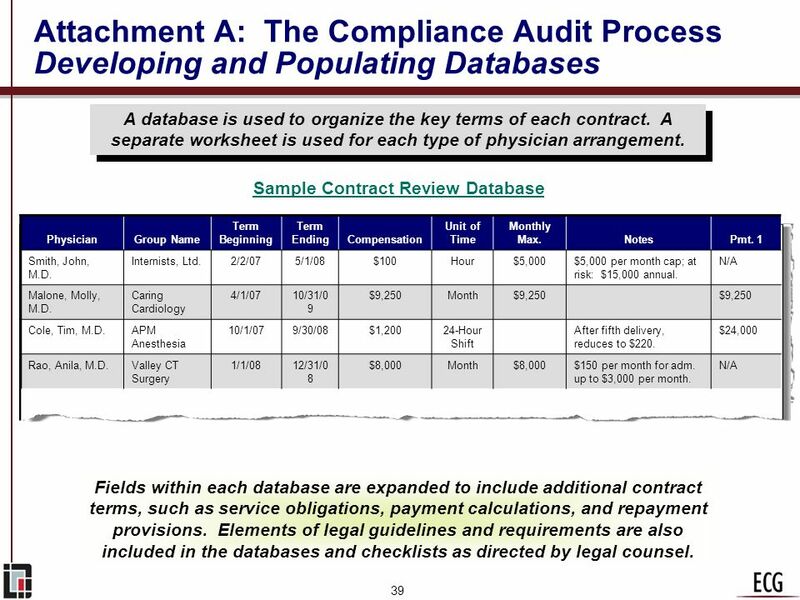 Attachment A: The Compliance Audit Process Developing and Populating Databases A database is used to organize the key terms of each contract. 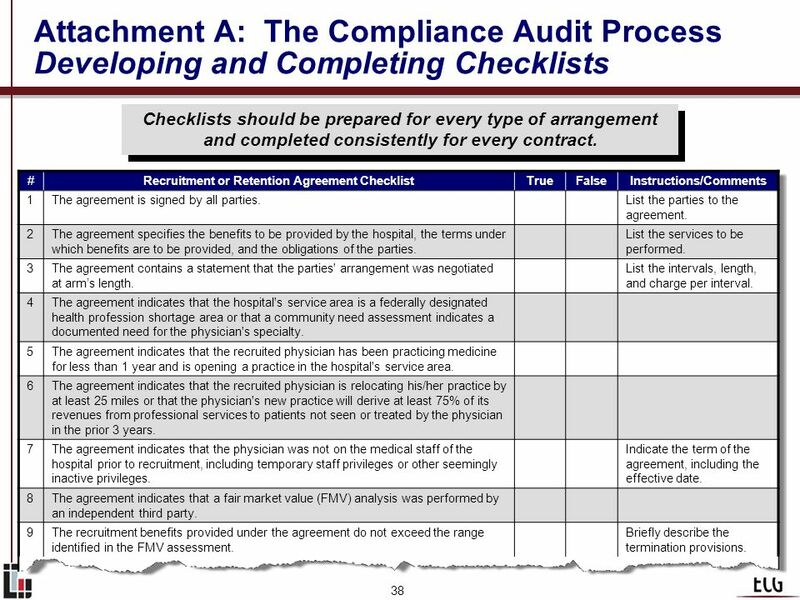 A separate worksheet is used for each type of physician arrangement. Sample Contract Review Database Physician Group Name Term Beginning Term Ending Compensation Unit of Time Monthly Max. Notes Pmt. 1 Smith, John, M.D. Internists, Ltd. 2/2/07 5/1/08 $100 Hour $5,000 $5,000 per month cap; at risk: $15,000 annual. N/A Malone, Molly, M.D. Caring Cardiology 4/1/07 10/31/09 $9,250 Month Cole, Tim, M.D. APM Anesthesia 10/1/07 9/30/08 $1,200 24-Hour Shift After fifth delivery, reduces to $220. $24,000 Rao, Anila, M.D. Valley CT Surgery 1/1/08 12/31/08 $8,000 $150 per month for adm. up to $3,000 per month. Fields within each database are expanded to include additional contract terms, such as service obligations, payment calculations, and repayment provisions. Elements of legal guidelines and requirements are also included in the databases and checklists as directed by legal counsel. Every payment is matched to a contract and its required documentation. Payments without a corresponding contract or documentation are flagged for additional investigation. 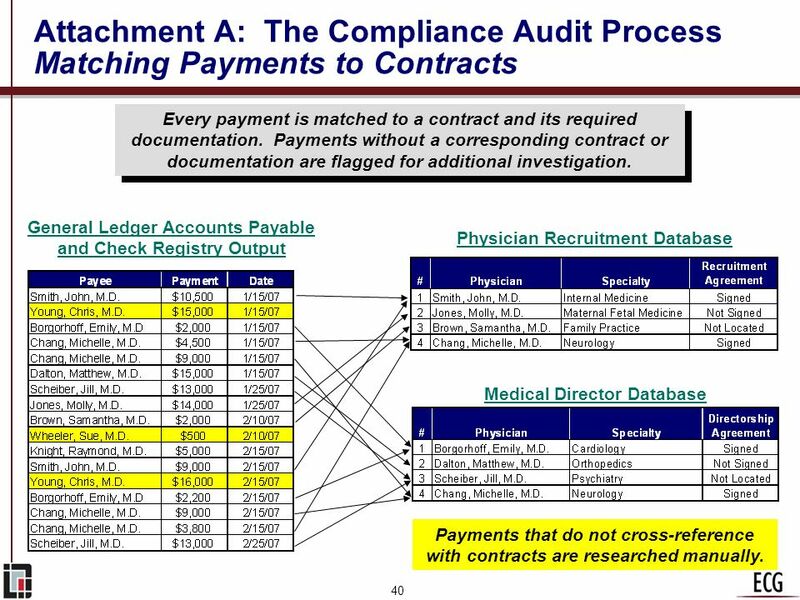 General Ledger Accounts Payable and Check Registry Output Physician Recruitment Database Medical Director Database Payments that do not cross-reference with contracts are researched manually. 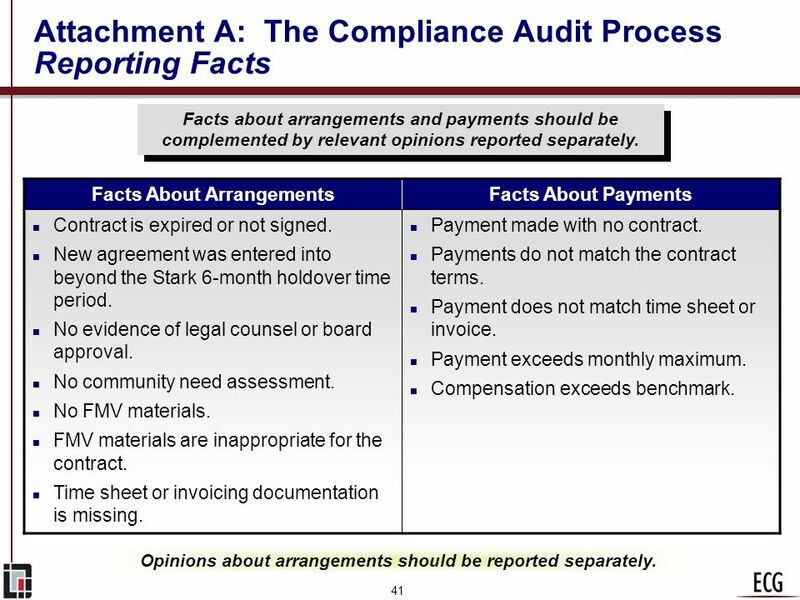 Facts about arrangements and payments should be complemented by relevant opinions reported separately. Facts About Arrangements Facts About Payments Contract is expired or not signed. New agreement was entered into beyond the Stark 6-month holdover time period. No evidence of legal counsel or board approval. No community need assessment. No FMV materials. FMV materials are inappropriate for the contract. Time sheet or invoicing documentation is missing. Payment made with no contract. Payments do not match the contract terms. Payment does not match time sheet or invoice. Payment exceeds monthly maximum. Compensation exceeds benchmark. Opinions about arrangements should be reported separately. Download ppt "Agenda I. Overview of Fair Market Value (FMV) Issues"
6.1 PPS t/a Carnegie et al; Accounting: Financial and Organisational Decision Making © 1999 McGraw-Hill Book Co. Aust. ACCOUNTING Financial and Organisational.